The four o'clock hour displays a date window, and the 12 o'clock hour is indicated with the Swiss Army logo. The black calfskin leather band features white accent stitching and securely fastens with a buckle clasp. NEW VICTORINOX SWISS ARMY INOX. BLACK DIAL. BLACK LEATHER STRAP. STAINLESS STEEL CASE. SCREW IN CASE BACK. Instruction manual and box. 21 mm wide black rubber strap. Black dial, silver-tone luminous hands & markers. Red second hand. Stainless steel case. Screw down stainless steel case back. Water Resistant to 20 ATM. MODEL: 241758. NEW VICTORINOX SWISS ARMY INOX. TITANIUM CASE. ORANGE RUBBER STRAP. SCREW IN CASE BACK. We created the I.N.O.X. Watch to endure a life as adventurous as yours. It’s ready. Watch features date. scratch-resistant, triple-coated anti-reflective sapphire crystal. Bracelet color silver. Rugged and uncompromising, the I.N.O.X. Carbon collection watch from Victorinox Swiss Army stood up to 130 stress and endurance tests, proving its exceptional durability. New with ticket in signature Victorinox box. MODEL: 241812. NEW VICTORINOX SWISS ARMY INOX. TITANIUM CASE. SCREW IN CASE BACK. BLACK DIAL. SCREW DOWN CROWN. Blue dial, silver-tone luminous hands & markers. Scratch resistant Sapphire crystal. instruction manual and box. Red second hand. Water Resistant to 20 ATM. 22 mm wide stainless steel bracelet. Screw down crown. Sleek silver-tone brings it to life with a round stainless steel case and fixed bezel. Easy to wear, it coordinates with your closet as a crown winds on the right and a black leather strap band secures it. 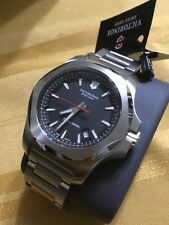 Victorinox Men's I.N.O.X. Watch Quartz movement Silver-tone stainless steel bracelet Fold-over clasp Stainless steel bezel and case Scratchproof anti-reflection sapphire crystal Screw-Down crown Gray dial with luminous silver-tone hands Date display between the 4 and 5 o'clock position Case: 43mm in diameter x 13.58mm thick Bracelet/strap: 21mm wide x 7.75in long Water-resistant up to 200 meters 1-year limited third party warranty Our products are 100% genuine. In some cases we purchase merchandise from trusted independent suppliers and not directly from the brand owner. In all cases we stand by the authenticity of every product sold on our site. Display: Analog. Crystal: Scratch-Resistant, Triple-Coated Anti-Reflective Sapphire Crystal. Warranty: 1 Year Savvy Watch Warranty. Learn more. Band Color: Blue. Dial Color: Blue. Band Material: Rubber. The product is new. If you have any questions, please ask. Thank you. VICTORINOX SWISS ARMY INOX PARACORD RED 241744.1 Stainless steel case with a red textile strap. Paracord strap Dial Type: Analog. Luminescent hands and markers. Date display between the 4 and 5 o'clock positions. Swiss quartz movement. Scratch resistant sapphire crystal. Functions: date, hour, minute, second. Sport watch style. Water resistant at 200 meters / 660 feet. Bumper not included. Watch Information Band MaterialStainless steel. Band ColorSilver. Dial Window Material TypeAnti reflective sapphire. Case materialStainless steel. Bezel materialStainless steel. Item ShapeRound. Part Number241739.1. Victorinox Swiss Army 241757 is equipped with a 21mm wide grey rubber strap with a buckle clasp. ZIppo lighters. Swiss Army Knives. Display: Analog. Warranty: 1 Year Savvy Watch Warranty. Crystal: Scratch-Resistant, Triple-Coated Anti-Reflective S. Band Color: Green. Dial Color: Green. Learn more. Band Material: Rubber. Victorinox Swiss Army 241758 is equipped with a 21mm wide orange rubber strap with a buckle clasp. ZIppo lighters. Swiss Army Knives. Victorinox Swiss Army 241837 is equipped with a 21mm wide solid stainless steel with a fold over push button clasp. ZIppo lighters. Swiss Army Knives. Window Material: Scratch Resistant, Anti Reflective- Triple Coated Sapphire Crystal. Case Material: 316L Stainless Steel. Bracelet Material: Stainless Steel. Water Resistant Depth: 200m - Professional Diver watch. Display: Analog. Warranty: 1 Year Savvy Watch Warranty. The only limits I.N.O.X. has are the ones that we impose on it. Its perfection verges on an obsession, its performance, the stuff of records. Consequently, following the blue, black, green and red versions, there is now an I.N.O.X. with a steel bracelet. We created the I.N.O.X. Paracord watch to endure a life as adventurous as yours. Band Material: Survival Paracord Bracelet. Warranty: 1 Year Savvy Watch Warranty. Calendar: Date Window. Band Color: Red. Scratch-resistant, triple-coated anti-reflective sapphire crystal - screw-down crown. Case Thickness: 13 mm. - Water Resistance: 20 ATM/200 M/660 FT.
Fitting a watch is of course no problem, however, the watch strap should not be broken or bent out of shape. Standard plastic boxes will not be replaced if broken during transport. Stainless Steel. Dial Color. Display: Analog. The only limits I.N.O.X. has are the ones that we impose on it. Its perfection verges on an obsession, its performance, the stuff of records. Consequently, following the blue, black, green and red versions, there is now an I.N.O.X. with a steel bracelet. Victorinox Swiss Army 241782 is equipped with a 22mm wide solid stainless steel bracelet with a fold over safety lock clasp. ZIppo lighters. Swiss Army Knives. Victorinox Swiss Army 241570 is equipped with a 21mm wide beige stitched genuine brown leather strap with a buckle clasp. Swiss Army Knives. The I.N.O.X. Professional Diver is an ISO 6425 certified diving watch that combines the strength of I.N.O.X. with the features divers count on. The unidirectional rotating bezel features a count-up scale so you"ll always know where you stand, and the. 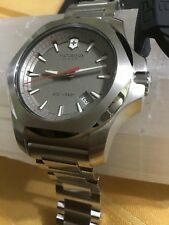 Victorinox Swiss Army 241739.1 is equipped with a 21mm wide solid stainless steel bracelet with a jewelry clasp. ZIppo lighters. Swiss Army Knives. Victorinox Swiss Army 241736.1 is equipped with a 22mm wide red rubber strap with a buckle clasp. ZIppo lighters. Swiss Army Knives. bags & wallets. 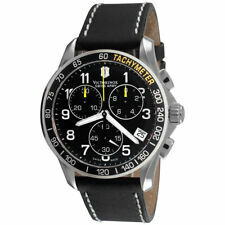 With a Swiss made case crafted from high-grade stainless steel (316L) and a highly resilient genuine rubber strap. We created the I.N.O.X. Watch to endure a life as adventurous as yours. It’s ready. Victorinox Swiss Army 241777 is equipped with a 21mm wide black rubber strap with a buckle clasp. ZIppo lighters. Swiss Army Knives. Fully functioning and working. Made in Switzerland. Swiss Army Watch Blue. Includes glow in the dark hands. Dial Color: Blue. Strap: Stainless Steel. Victorinox Swiss Army 241810 is equipped with a 22mm wide grey rubber strap with a buckle clasp. ZIppo lighters. Swiss Army Knives. Technical Soul in a Confident Exterior- On the slopes, in the boardroom, or out in the wild. Dial Color: Olive Green. Case Material: Sandblasted Titanium. Warranty: 1 Year Savvy Watch Warranty. Band Material: Leather. Victorinox Swiss Army 241734.1 is equipped with a 22mm wide blue rubber strap with a buckle clasp. ZIppo lighters. Swiss Army Knives. Upgrade your wristwear with this Victorinox Swiss quartz watch with a Blue Rubber band. Swiss quartz. Stick hands. Three hand, water resistant, calendar date. Made with titanium. Victorinox Swiss Army 241776 is equipped with a 21mm wide black paracord nylon strap with a hook clasp. ZIppo lighters. Swiss Army Knives. Case Style Stainless Steel Casing with Blue Dial and Removable High Impact Rubber Case Guard. Function 3-Hand Analog Display, Date Calendar, Luminous Markers/Hands, Easy Read Dial & Water Resistance. Scratch Resistant, Anti-Reflective Triple Coated Sapphire Scratch Resistance Crystal. Victorinox Swiss Army 241811 is equipped with a 22mm wide white rubber strap with a buckle clasp. ZIppo lighters. Swiss Army Knives. 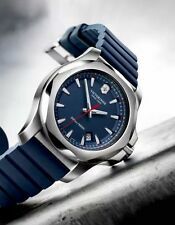 Victorinox Swiss Army 241759 is equipped with a 21mm wide blue rubber strap with a buckle clasp. ZIppo lighters. Swiss Army Knives. Victorinox Swiss Army. Dial Color: Silver Gray. Strap/Bracelet Material: Leather. Dial Markers: Stick. Manufacturer's Reference # 241738.1. Crystal: Sapphire. Keep up with your busy schedule with a Victorinox I.n.o.x. men's watch. These men's watches are often wider with larger faces for an eye-catching appearance. Grey band watches will add a touch of elegance to any ensemble. Impressive in their simplicity, they have a traditional appearance for a minimalist timepiece. Red band wristwatches will add a pop of colour to any look. With a unique band colour, these watches are perfect choice for expressing your personal taste. Genuine leather band watches have a traditional style, which gives thems a timeless feel. Genuine leather bands wear well and develop a patina, ageing beautifully over the course of time. Solid gold bands are resistant to corrosion, making them extremely durable. Entirely made of gold, the bands are highly precious and beautiful. Pink face wristwatches are great for adding a delicate and feminine flair to any outfit. With a unique face colour, these Swiss Army watches are excellent for a one-of-a-kind accessory. Ivory face wristwatches are traditional and tasteful accessories that will never go out of style. With subtle elegance, they showcase sophistication and class.